Small - $56.99 Only 6 left! Medium - $56.99 Large - $56.99 Only 9 left! Fortunately, we have the Teen Titans. Housed in Titans Tower just off the coast of California, this group of supposed sidekicks prove that they can do a ton on their own and even more as a team. Their leader, Robin, brought up from a young age as an amazing acrobat developed some serious skills and those tricks transferred perfectly to free-running and flipping over obstacles while assisting the Caped Crusader in his two-on-twenty fights with the notorious archvillains and Robin brought those talents right along to help the Titans! You’ve raised your child right, which means that that kiddo is ready to do whatever it takes to help out any local buddies! Fortunately, we’ve got the gear you need in this Teen Titan’s Go! Robin costume. 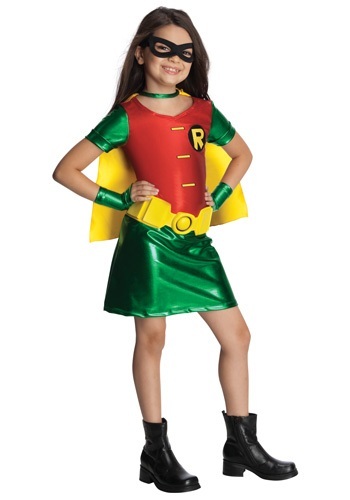 This superhero red and green dress shows off Robin’s iconic color scheme and comes with the very same yellow satin cape. Metallic green gauntlets protect your tyke from any incoming attack and the black Robin eye mask protects your kiddo’s identity, all while the molded rubber utility belt provides an array of gadgets. Wicked-doer beware, because this Titan is on the task!